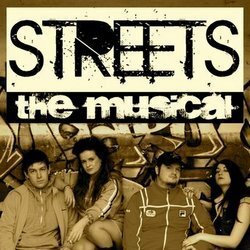 ‘Streets’ is a promising piece of work from new Scottish writing talent and if the response to the show was anything to go by it could certainly have a future. It does need more development though, some characters are a bit flat it was confusing as to who was living with who in who’s flat for example. Musically there are a couple of really good numbers but all too often there seems to be a song for no reason and then that song doesn’t fit the context of the plot. For example we can be building up to a tense moment and then suddenly burst into a slow number. 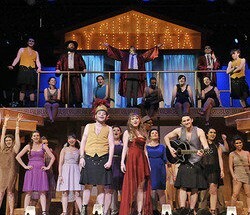 Overall, acting and vocally, the cast are a bit weak in the ensemble numbers and just don’t deliver the energy or the passion which the numbers seem to demand. However, Rosemary Stanford as the mother is outstanding. She has an excellent presence, her acting and singing lifts the whole show when she’s on and is a delight to watch. It would be interesting to see this in a couple of years with more development of the characters and plotlines and more of a contrast showing the lives the characters get drawn into.